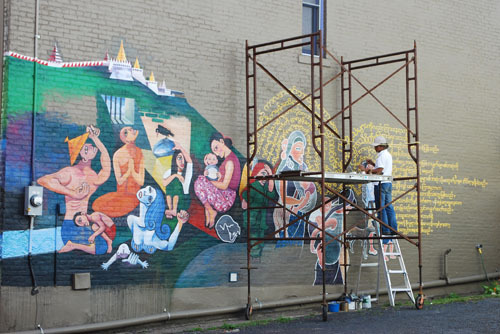 Than Htay Maung works on 324 Sampsonia Way most sunny days, painting an enormous mural that blends images of his native Burma with his new home of Pittsburgh. Right now, he is concentrating on the side of the house, painting gold letters that snake around a procession of people who seem to emerge from a prison. 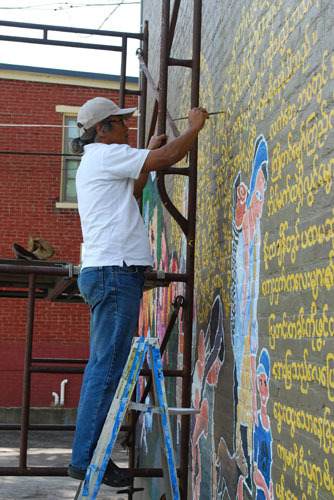 The words come from an essay by his wife Khet Mar about coming to Pittsburgh from Burma. 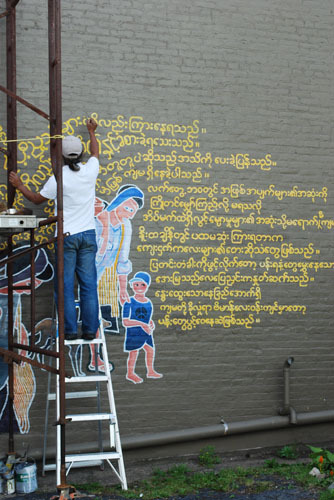 It is in Burmese—a language few North Siders will be able to read, but the expressions of the figures are legible no matter what language you speak. 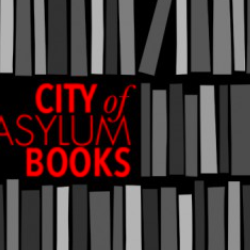 The prisoners crane their faces upward, toward the tiny window offering a stream light into the dark cell. Their eyes—which the painter emphasizes with thick outlines—show their anguish. Their looking confronts the viewer with the human cost of Burma’s atrocities, a situation that most of the world chooses to look away from. A gesture that speaks without language is the protective touch of the mother hand on her son’s shoulder at the end of the procession. The Burmese military is known to take children to be soldiers. “They lose their childhood,” Than Htay Maung said. 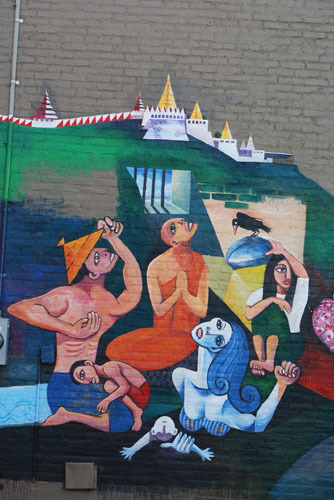 The people along the sidewall are representative of all the different ethnic groups in Burma who, because of discrimination, must constantly move from place to place. The child at the end of the procession wears a t-shirt with a peace symbol, a recurring motif in Than Htay Maung’s work. 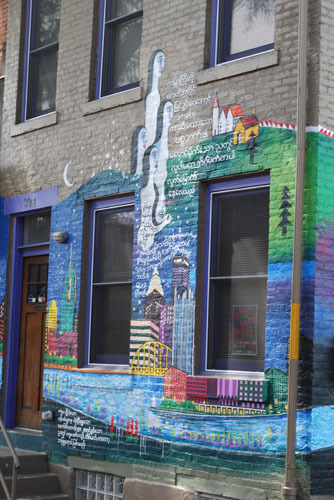 The painting on the front of the house layers images of Pittsburgh with the mountains of Burma, text by Khet Mar, and four ghostly figures who appeared to Khet Mar in a dream. Passers-by will recognize Pittsburgh’s riverfront park and the cityscape of downtown. Than Htay Maung, who is famous in Burma as an illustrator and installation artist, is not used to working this big and was nervous at first about covering an entire house. He began working on the front in the summer of 2009 and was surprised by how fast it went. This was in part because of all the encouragement he received from the neighborhood. People would stop by and check out his progress. 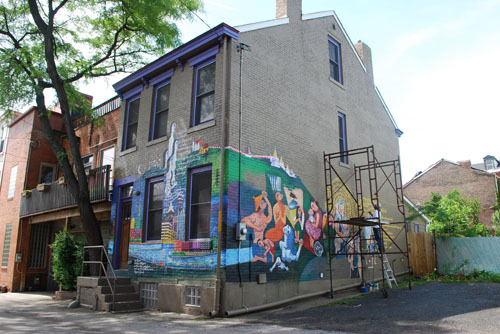 “I had so much strength to paint because of the people,” he said. He plans to cover side of the house up to the third floor window—as far as his scaffolding will reach. One Comment on "Walk Down Sampsonia Way: Painting with the Steel City"
Thank you for sharing with the city of Pgh. The desire to escape abuse, goernment control and supression of freedoms is why our counrty fought for its independence from England. 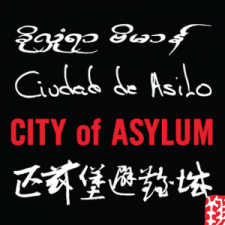 We in the U.S. admire all you are doing for the people in Burma and are glad that you are being a voice for them.